I was honored to be appointed to the INFORMS (Institute for Operations Research and the Management Sciences) History and Traditions Committee and will be serving on this committee through 2018. The committee is a wonderful group of Operations Research /Management Science scholars and includes also a historian of science, Dr. Will Thomas. We had hosted Will at the Isenberg School of Management back in 2005 in our UMass Amherst INFORMS Speaker Series, when he was a doctoral student at Harvard University. He is the author of a recent book,published by MIT Press. Also, on the committee is Dr. Irv Lustig, who was an undergraduate in Applied Math at Brown University when I was a PhD student there and I was his TA for a course taught by my dissertation advisor, Professor Stella Dafermos. Irv went on to get his PhD at Stanford University and his dissertation advisor was none other than a giant of Operations Research, Professor George Dantzig, whose research and mentorship and friendship helped to build the great community of INFORMS, as well as its predecessors, ORSA and TIMS. Irv spoke in our Speaker Series in the Spring of 2006. That year I was a Fellow at the Radcliffe Institute for Advanced Study at Harvard and still managed to help the students organize the Speaker Series and to come back on Fridays to support them. Dantzig passed away in May 2005 at age 90. There is a memorial site in his honor. Dr. Mark Eisner of Cornell University has chaired this committee for the past three years and his energy and ideas as well as leadership is making a log of exciting things happen in preserving our history and also providing exceptional resource and educational materials about our field. Also, and this I find to be something quite special, Mark knew Stella when she was a postdoc at Cornell University, after receiving her PhD from Johns Hopkins in Operations Research, and before coming to Brown University. Also on the committee are luminaries of Operations Research who are household names: Dr. Arjang Assad, Dr. Art Geoffrion, Dr. John D.C. Little, and Dr. Shaler Stidham Jr. When I teach my classes I always include stories of individuals who have been instrumental in the development of the various topics and even include photos of the personages in my lecture slides. I think that it is very important that students know and can visualize who made the scientific discoveries, whether in terms of a methodology, an algorithm, or a very cool application. I have been lucky that through our professional societies that I have been able to meet many of the shining stars, starting when I was a graduate student. I think that meeting people whose work inspires you brings a humanity to the research and also motivates you. Plus, you can learn so much from such people in terms of professional development, if you just ask. A wonderful contribution to the INFORMS History and Tradition webpages are the compilations of the oral histories. I have been enjoying viewing and learning from them immensely. Listening to the words of wisdom is making history of our field come alive and it also helps to preserve it. Right now all the interviews are with males so I am doing my best to get more female operations researchers featured. I know that several additional interviews are planned even for the INFORMS Conference in Nashville this coming November. And speaking of leadership in Operations Research, I urge you to visit the Miser-Harris Presidential Portrait Gallery, where the Presidents of ORSA, TIMS, and, INFORMS are featured a long with links to their biographies. The gallery is named after Professors Hugh Miser and Carl Harris and Hugh was a Professor at UMass Amherst for several years but before I joined the faculty. All the Presidents of TIMS were male. There was only one female President of ORSA and that was Dr. Judith Liebman, who was a contemporary doctoral student of Stella Dafermos' at Johns Hopkins. Several of my doctoral students have received the Judith Liebman Award from INFORMS for their activities with our award-winning UMass Amherst INFORMS Student Chapter. I am delighted that there have been 7 female Presidents of INFORMS, which is fabulous. Dr. Robin Keller, the President before Dr. Ed Kaplan, has also been taking part in our committee teleconferences, as well as Melissa Moore, the Executive Director of INFORMS and Mary Magrogan, INFORMS Director of Membership, Subdivisions & International Activities. I urge you to visit the INFORMS History and Traditions pages. I find the personal memoirs also very informative and inspiring. More information on the committee and its activities can be found in the article written by Assad and Eisner. A guided tour of the website is provided in an article written by Mark that appeared in OR/MS Today. The biographical profiles of those who have made significant contributions to our field and were born before the end of World War II are also very interesting to read. 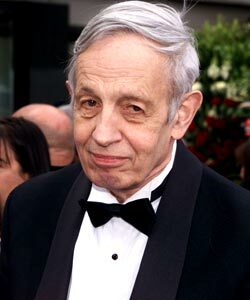 And, of course, the list of Nobel Laureates in Economic Sciences with OR affiliations and contributions is also very worthwhile to peruse and among those listed I note that dozens of my papers have cited the work of John Nash. INFORMS will be redesigning its website and I hope that we can feature the information associated with the History and Traditions more directly and prominently. Also, INFORMS is looking for a part-time student website intern to assist in the enhancement of the web site devoted to the history of Operations Research. The intern would work from his or her home location via email at the direction of members of the History and Traditions Committee of INFORMS, the Institute for Operations Research and the Management Sciences. If you may be interested or know of someone who may be, please let me or any of the committee members know. Thanks! Actually, visiting the site and serving on this committee is sometimes like a walk down Memory Lane and I conclude this blogpost with a photo taken of me and Professor George Dantzig, way back when, at an ORSA conference in San Francisco. Why is Business Research So Unbusinesslike? I always look forward, as a Radcliffe Institute for Advanced Study at Harvard University alumna, class of '06, to my regular emails from Harvard University, including those that I receive from the Harvard Gazette. This morning in the email from the Harvard Gazette headlines was the intriguing teaser: Why is Business Research So Unbusinesslike? When I clicked and read the article I knew that I would have to comment on it on this blog. The teaser was for the article: Why Isn't Business Research More Relevant to Business Practitioners? from the Harvard Business School (HBS) and its main focus was on the paper by HBS Professor Michael Toffel, Enhancing the Practical Relevance of Research, which appears in the September 2016 issue of the journal Production and Operations Management. Since I am in the Department of Operations and Information Management at the Isenberg School of Management, I am a member of the Production and Operations Management Society and subscribe to this journal. Interestingly, Professor Chris Tang of UCLA's Anderson School of Management had a similar article in the journal MSOM: entitled: Making OM Research More Relevant: Why?" and "How?" which I had blogged about. Toffel, in his article, focuses on Operations Management as well as Organizational Behavior, two disciplines, which are not usually cast together. I find it quite interesting that the relevance issue keeps on coming up. 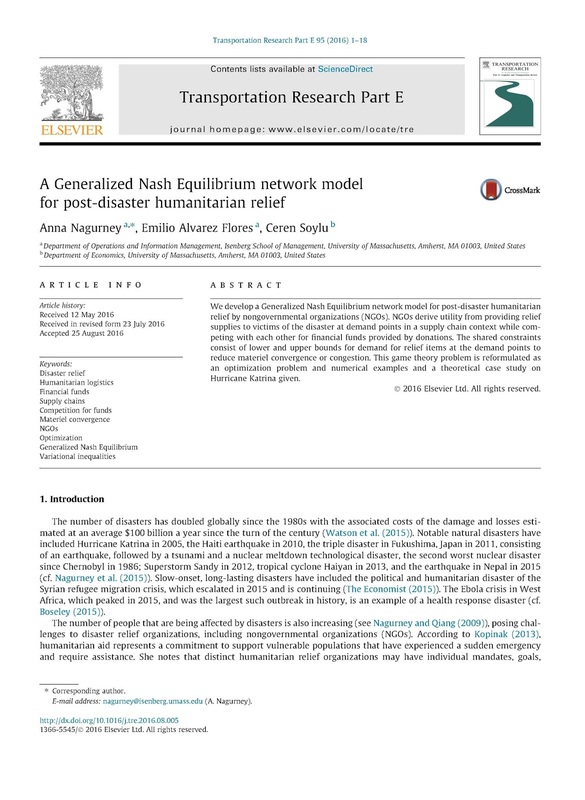 I know from personal experience in terms of my research and that of many of my collaborators as well as my doctoral students that much of our work is driven by crucial problems that need solving in practice and, oftentimes, that need will also drive our theoretical and methodological work in operations research. I do see papers and quite, frankly, now decline reviewing such where a multitiered supply chain that is studied in a paper consists of a single manufacturer and a single retailer. I find that the drive towards managerial insights on problems that are simplistic and not real may be easy to solve but with the availability of both data and algorithms, why not tackle and handle problems that exist in reality? Our work on supply chains has ranged from pharmaceuticals to fast fashion, food, medical nuclear supply chains, and also to humanitarian relief supplies and blood supply chains. Some highlights from Toffel's article I further discuss below. My rule of thumb for working on a problem was whether the answers to the following four questions were yes, no, no, and yes: Is the problem very important (i.e., could it directly or indirectly lead to catastrophic consequences?) Has the problem been sufficiently addressed in the academic literature? Has the problem been satisfactorily addressed by policy makers? Would the problem be fun (i.e., sufficiently challenging) to work on? In terms of enhancing research relevance, Toffel suggests reading practitioner publications and the popular and industry presses, which I regularly do and urge my students to, as well. He also recommends creating on-campus encounters with practitioners to give guest lectures to students (and you can also meet with them). And he even notes the importance of student clubs! As for the former, every spring I teach a course on Humanitarian Logistics and Healthcare in which I bring practitioners as guest lecturers. They provide educational experiences for students and also raise many research questions. In addition, I am in my 13th year of serving as the Faculty Advisor to the UMass Amherst INFORMS Student Chapter and we co-organize a speaker series and also have field trips, such as to ISO New England, which is responsible for electric power reliability for New England. I consider activities of the student chapter so important that I have used my Smith Chaired Professor funds since the chapter's inception to support the chapter's activities. Toffel recommends attending crossover workshops with practitioners and also practitioners conferences. I can personally attest to how wonderful the INFORMS Annual Analytics conference is, for example, where practitioners and academics as well as students can interact intensely and benefit from longer than the typical conference presentations. As for workshops, we have even obtained grants to organize workshops. We have done one on cybersecurity held at the Sloan School at MIT two years ago, which I have blogged about. I also organized an amazing one at the Rockefeller Foundation's Bellagio Center on Lake Como on Humanitarian Logistics: Networks for Africa. Toffel also mentioned that it is important to convey relevant insights to practitioners and this can be done through blogs and social media. He highlights several blogs but not a single one from female bloggers. 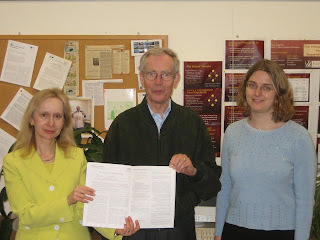 I single out Laura McLay's long-running excellent blog on operations research. Of course, everyone in Operations Research is also well-aware of Mike Trick's blog. Mike is an Associate Dean at the Tepper School at Carnegie Mellon University and also the President of IFORS. Toffel ends his article by suggesting how academic institutions need to change and that includes the training of our doctoral students. He also notes that making changes takes time and implementing his recommendations is time-consuming. I know that my conscience is clear. And, besides, as Larry Wein says, doing these things is fun! Relevance is richly rewarding. Today is a picture perfect day in September - simply beautiful and although it is a Friday it was especially busy. This morning I met with a student advisee, listened to one of our doctoral students deliver the oral component of her comprehensive exam for her PhD is Management Science, and then it was time for a quick lunch and the groundbreaking ceremony for the Business Innovation Hub for the Isenberg School of Management, a $62 million project, which has gotten a lot of press in The Boston Globe, in the Springfield Republican, and in the Daily Hampshire Gazette. On top of all the good news, one of my doctoral students, Shivani Shukla, heard from INFORMS that she was accepted into the Doctoral Colloquium that will take place at our annual INFORMS conference in Nashville in November and another doctoral student of mine, Deniz Besik, heard that our paper on food supply chains and quality with a focus on farmers' markets' was accepted for presentation at the INFORMS Computing conference, which will take place in Austin, Texas, in January 2017. The setting for the groundbreaking ceremony today was the green outside of the Isenberg School and a big white tent was set up with a podium. Associate Dean Professor Lisa Masteralexis was the emcee for the event and the program is below. The program consisted of a terrific list of speakers from our Chancellor, to alums, government officials, and other special guests, and, of course, the Dean of the Isenberg School, Dr. Mark Fuller. There were even treats for us to enjoy, thanks to Ken Toong, an Isenberg School MBA alum, without whom UMass Amherst would not have gotten the top ranking for university food in the USA! One of the highlights today was meeting two of my former Operations Management students, who are very successful Isenberg School alums. Below are some photos of our illustrious speakers and the emcee. Chancellor Kumble Subbaswamy is in the above photo. His enthusiasm for UMass and recognition of the terrific trajectory that the Isenberg School is on under Dean Mark Fuller were inspiring. Stan Rosenberg, UMass alum '77, who is now President of the Massachusetts Senate, gave an uplifting presentation focusing on the great advances in infrastructure and research stature and prominence at UMass Amherst, the flagship campus, since he was a student. He has been an amazing ambassador for UMass and the education of our students and we are very grateful to him. Philip Johnston, '68, in the above photo, who is chair of the UMass building authority and a member of the UMass board of trustees emphasized how important buildings are. Henry Thomas III, the former chair of the UMass Board of Trustees, also spoke. He has been President and CEO of the Urban League of Springfield since 1975. Ed Shirley. '78, a major benefactor of the Isenberg School and very successful businessman, emphasized, as had our Chancellor, the great strides in rankings that the Isenberg School has experienced in the past few years. The school is now ranked first in the northeast among private universities for undergraduate business education. He, as others, also stressed the importance of philanthropy and private giving. He is a donor of a scholarship named after him and one of the young alum speakers, Martin Boyle, was a recipient of this scholarship. I was also thrilled to hear him say that we should be grateful to the search committee for selecting Dr. Mark Fuller as our Isenberg Dean, who has held that leadership position for 8 years now. I told Mr. Shirley afterwards, that both the emcee, Associate Dean Lisa Masteralexis, and I had served on the search committee. In addition, my Marketing colleague, Professor Kathy Debevec Witz also had. Let me just say that this group of female professors had super insight and intuition in lobbying for Dr. Fuller! Coincidentally, Mr. Johnston had chaired the committee that brought Chancellor Subbaswamy to head the UMass Amherst campus 5 years ago, another great hire. Go UMass! It was also very special to hear two of our recent alums, Stephanie Berenson '16, and Martin Boyle '15, speak. And, given the small world that Massachusetts is, Henry Thomas noted that he was in a study group when he was in law school with Martin Boyle's father, which was a neat connection. The love for the school exhibited by these alums was clear and they make the faculty and staff proud. Stephanie and Martin are in the photos above. Then it was time for Dean Fuller to speak and he quipped that the Chief Marketing Officer, Chris Pilsner, will hear from him that he was last and had to follow so many great speakers today. What I appreciated very much in Dean Fuller's speech was his recognition of the importance not just of rankings but also of reputation plus he emphasized and thanked faculty and our wonderful students. He also reminisced his first conversation with our great benefactor after whom the school is named, Gene Isenberg, who stressed how any problem can be solved with education, including poverty, and Fuller noted that the most difficult problems require the best education. Dean Fuller holds the Thomas O'Brien endowed chaired professorship, named after our former dean, Dr. Tom O'Brien, who was a great friend of the Isenbergs. Dr. O'Brien also came to this event. And, since this was a groundbreaking ceremony, there was a photo opportunity for hard hats and shovels. Even the UMass mascot, Sam, the Minuteman, showed up for the event. I also caught up with several colleagues as well as with our new Isenberg School head of development, Scott Benton, who just this past Tuesday, has dinner with my former doctoral student, Dr. Stavros Siokos, at the Royal Automobile Club in London. Stavros had hosted me and my family at the RAC last summer when I was a Visiting Fellow at All Souls College at Oxford University for 2 and a half months. And I received a souvenir of a t-shirt and hat. Our students were treated to ice cream of several flavors, including green tea and maple walnut, and toppings. It was a perfect day and I feel very lucky to be part of the great community and family that is the Isenberg School of Management! Thanks also to the wonderful emcee that made the event flow beautifully, Associate Dean Lisa Masteralexis. And for all those alums out there as well as interested parties and future students - you can view the progress of the construction via webcam, which is fun. I am a huge fan of the magazine The Economist and have been a subscriber for many years. If I have an upcoming long flight then I store up and hoard several issues because I know that I will be engaged reading them and also sometimes educated, but not always. I have also written Letters to the Editor to The Economist. One was published in 2008 and it had to do with traffic and drivers' behavior in choosing routes. Over the past few weeks I have especially enjoyed a series in The Economist, which is in 6 parts, entitled: Six big economic ideas. The fifth column in this series, however, piqued me sufficiently to compose a letter. The column was on: Game theory: Prison breakthrough - The fifth of our series on seminal economic ideas looks at the Nash equilibrium. Specifically, the sentences in it that needed proper acknowledgment are: "Self-interested drivers opting for the quickest route do not take into account the effect of lengthening others' journey times, and so can gum up a new shortcut. A study published in 2008 found seven road links in London and 12 in New York where closure could boost traffic flows." And, in honor of both John Nash, whom I have cited in probably close to 100 of my papers, and also to Dietrich Braess, another brilliant mind, below I include photos of them. With me and Braess is Dr. Tina Wakolbinger, who was my PhD student at the Isenberg School of Management, and is now a Full Professor at the Vienna University of Economics and Business in Austria. There is something special about the month of September, when the new school year begins. The nights are cooler in the northeast, some of the leaves have started to change colors, and there is an air of anticipation. I am sure that you remember many "first days" of classes, from elementary school onward through high school and college, and perhaps graduate school or a professional school. I never get tired of the start of the new academic year and last night I was so excited, that I could hardly sleep. Today, was the first day of the new academic year at the University of Massachusetts Amherst and, in the Fall, I always very much enjoy teaching my Logistics and Transportation class, which is an elective in the Operations and Information Management Department. Also, if the classroom size permits, I allow interested students, especially from Industrial Engineering, into the course, who have some background in operations and modeling. Faculty members, as some students do, too, I expect, take the time to decide what outfit to wear on the "first day of school." One of my Marketing colleagues always wears a red tie and recommends something bright and cheery and for those of you who follow Alex Pentland's work (we have hosted him at the Isenberg School through our great UMass Amherst INFORMS Speaker Series), you will know that first impressions - which may be only seconds or minutes long - do matter! Pentland is from MIT and is a member of the National Academy of Engineering, a well-deserved honor. Today, after having breakfast, I checked my email messages and there was good news, and a perfect start to this special day. 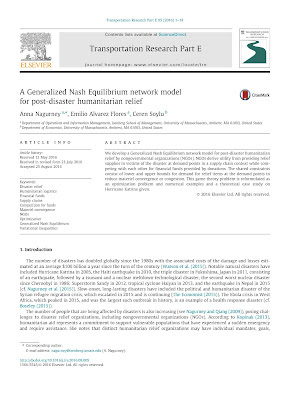 Our paper, which I have blogged about, A Generalized Nash Equilibrium network model for post-disaster relief, and which was co-authored with one of my former undergraduate students, Emilio Alvarez Flores, who received a degree from the Isenberg School in May 2016, and a colleague from economics, Professor Ceren Soylu, is the lead article in the November issue of Transportation Research E. I received a nice preprint today before my class. Having such news before your first class is clearly energizing plus synergistic. During class I asked the students to share a fun fact about themselves having to do with Logistics and Transportation, and these were so interesting and so much fun - from stories about commuting close to two hours each way for their summer internships, to riding mopeds as a mean of transport in Thailand and without a helmet, to driving over 3,000 miles this summer to help a family member move, to flight delays and travails, to working on yachts in Boston, and also fear of flying. It should be a very interesting semester. One student mentioned that her favorite mode of transport was Uber! 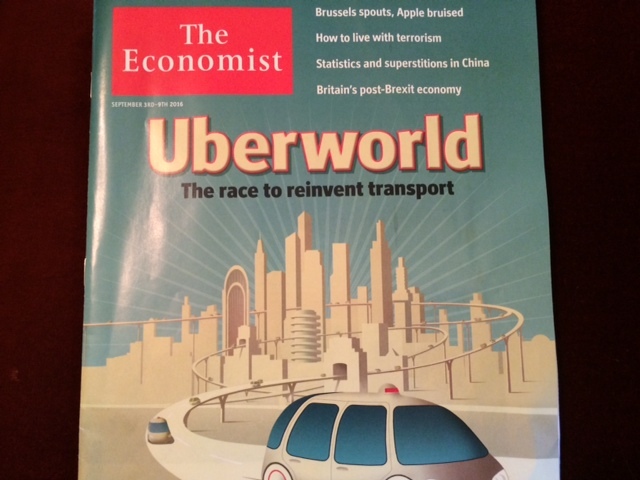 Coincidentally, last night I read the latest issue of The Economist and guess what was the cover story?! 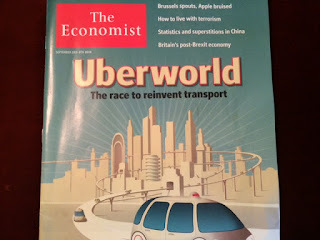 It will be fascinating to see what happens with autonomous vehicles, in general, and the impact on Uber, which has no hard assets, for example, one of the issues explored in this issue. And then, during office hours - I was not sure whether anyone would show up since I do not assign homework on the very first day - a student who was also in my Humanitarian Logistics and Healthcare class stopped by and we brainstormed for 90 minutes (it felt like 10 minutes) about possible topics for her honors thesis. (Emilio's honors thesis I co-supervised last year.) But, mostly, we just talked about healthcare and hospitals and improving the quality of care and our personal experiences. Catching up with colleagues at the Isenberg School was also a lot of fun today and hearing about how they spent their summers. Then it was time for our weekly NSF project teleconference on our EAGER grant (which are high risk but potentially high return projects). Along with Associate Dean of the College of Engineering at UMass Amherst, Dr. Tilman Wolf, I am working with colleagues from the University of Kentucky, who are computer scientists: Dr. Ken Calvert and Dr. Jim Griffioen. Together we had also had, with NCState and RENCI, a multiyear NSF Future Internet Architecture (FIA) grant and we worked on ChoiceNet. Our work is getting a lot of citations which is gratifying. And, as part of the discussion, Ken mentioned that he had listened to a very interesting podcast in the NPR Freakonomics radio series: http://www.npr.org/podcasts/452538045/freakonomics-radio, the July 213, 2016 edition, entitled: Is the Internet Being Ruined? He mentioned that Dr. David Clark of MIT was interviewed in this segment, so I had to listen. David Clark is one of the brains behind the Internet and an absolutely delightful individual. Two years ago, on September 20, 2014, I had the pleasure, with my wonderful colleagues: Professor Mila Sherman of Finance, Professor Senay Solak of my department, and Professor Wayne Burleson of Electrical and Computer Engineering, of organizing a workshop at the Sloan School at MIT on Cybersecurity Risk Analysis for Enterprise Security (a mouthful). This was made possible through a grant that we received from the Advanced Cyber Security Center in eastern Massachusetts and also with support from Mila's dissertation advisor at MIT, the renowned Dr. Andrew Lo, who also gave a keynote speech. Dr. David Clark, a visionary and thought leader, was also a keynote speaker and I still remember the research assignment that he had given me. You can see photos in my post on the link above. I hope that your first day of the new academic year was enjoyable and rewarding!